The SWOT Outlook is a new contribution by SESRIC to the efforts of the OIC Member Countries toward enhancing the level of their cooperation and integration as well as the level of their competitiveness, as a group, at both the regional and global levels. It provides most relevant statistical data and background information that would make the OIC Member Countries better informed of their collective potentials and needs and, thus, facilitate their elaboration on cooperation projects and integration schemes. 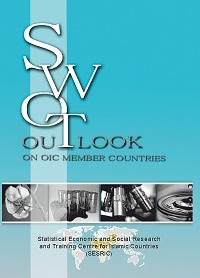 The outlook provides a SWOT profile on OIC Member Countries, as a group, in different socio-economic fields and sectors. It highlights the strengths and weaknesses of the OIC countries with a view to enhancing their competitiveness globally as well as the level of their cooperation. It also indicates major opportunities to be utilised for further growth and development in OIC countries as well as potential threats that they may face in the future. By presenting the strengths, weaknesses, opportunities and threats in a comparative manner with the developed and other developing countries, the SWOT analysis of the OIC Member Countries serves as a critical roadmap for better strategic planning and policy making at the OIC cooperation level.